Yesterday I filmed a wedding at the stunning Essex venue; The Roslin Hotel. WithÂ panoramic views of the Thames Estuary and a 4 star rating the venue is extremely well put together for a wonderful Southend wedding venue. The Roslin Wedding videographer for the day was chosen by Kelly and Stephen as they prepared for a March wedding. That morning I prepared to get ready for a cold, cloudy and drizzly start to the day. With my wellies and NorthFace jacket I headed down to The Roslin Hotel nice and early to start some arty and creative video shots of Southend seafront and the venue itself. As the day progressed the lucky couple started to see the clouds part and the sunshine come through. The photographer (Gary Derbridge) and I were extremely happy to see the sun come out to produce amazing shots like the Southend seafront silhouette shot taken by friend and colleague Gary. 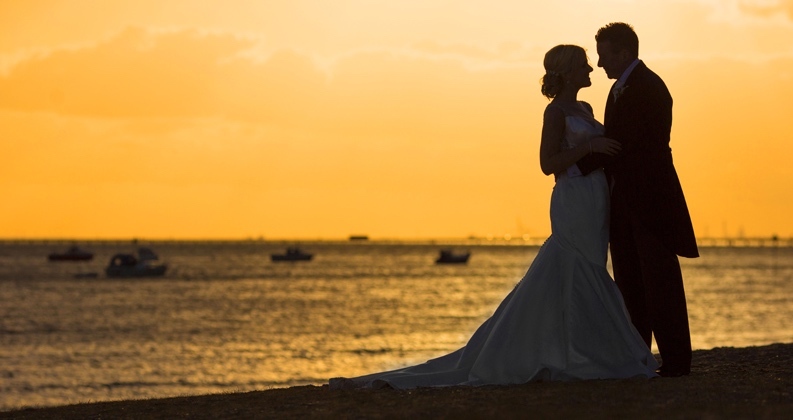 With beautiful views of the Thames Estuary and luxuries hotel premises this is a well catered for wedding venue that offers quality and high service. I would like to thank the venue coordinator for helping out on the day and always giving us a nod when things were happening. Another thank you to the friendly and helpful Roslin staff who provided me a couple of plasters after I cut my finger whilst getting creative on the beach front. All in all a great wedding video shoot and now looking forward to the edit. The Roslin Wedding Video highlights will be up soon, so keep a look out!